Peppermint Cocoa French Toast isn’t the kind of grab & go breakfast one totes along on the commute to work - it has to be savored, fussed over, enjoyed with intent… and a spare napkin. 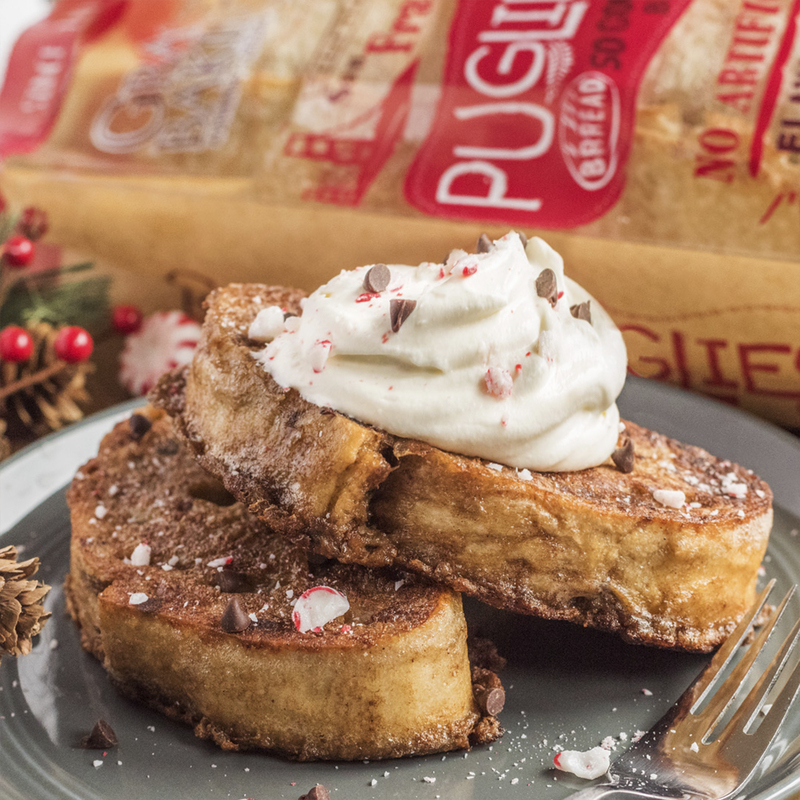 Created for discriminating palates with a thing for sweet, creamy Mascarpone whip, cocoa-rich pepperminty goodness – all made doubly scrumptious by preparing it with Grace Baking’s incomparable Pugliese. Peppermint Cocoa French Toast is the stuff of holidays and what memories are made of. However, we insist on moderation. It’s easy to wolf down a half dozen of these only to quickly discover that the chair you’re sitting in is suddenly a little smaller. Disclaimer aside, we hope you enjoy our food-fit-for-fame breakfast, and don’t be shy to write and tell us how much you loved it. It’ll make us smile, and isn’t sharing what the holidays are all about? Make Mascarpone Whip. In a medium bowl, combine Mascarpone cheese, powdered sugar, vanilla and salt. Stir until smooth and set aside. In another bowl, beat whipping cream until peaks form. Fold into the Mascarpone mixture until combined. Cover and set in fridge. In a large bowl, whisk together the eggs, cream, peppermint extract, cocoa powder and sugar. Heat butter and vegetable oil in a large skillet over medium heat. Dip bread in egg mixture and place in hot skillet. Cook about 2 minutes per side, or until golden brown. Serve topped with Mascarpone Whip and crushed peppermint candies.